Did Obama Violate U.S. Code Mutilating the Flag With His Own Ego? For thirty-five dollars you can own this print. The Barack Obama Store advertises the print as “Our Stripes: Flag Print,” and in place of the stars representing our fifty states we have the Obama logo — which, I guess, is supposed to represent the United States of President FailureTeleprompter. The United States Flag Code establishes advisory rules for display and care of the flag of the United States. It is Chapter 1 of Title 4 of the United States Code (4 U.S.C. § 1 et seq). This is a U.S. federal law, but there is no penalty for failure to comply with it. In fact, the U.S. Supreme Court has ruled that punitive enforcement would conflict with the First Amendment right to freedom of speech. This etiquette is as applied within U.S. jurisdiction. In other countries and places, local etiquette applies. The flag must not be marked with any insignia, letter, word, signature, picture or drawing. The obvious response from the Obama campaign (not that the media will demand one) will be that this is art, not the flag,. 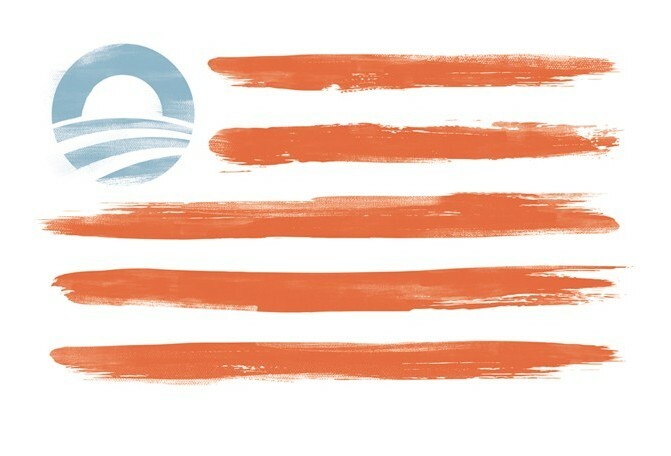 But the Obama campaign is advertising this as “Our Stripes: Flag Print,” so by their own description they are admitting this is “our” “flag,” and it most certainly has been marked with an “insignia, picture or drawing” — however you want to describe that noxious O. And if the argument is “since we made it, it’s not THE flag,” I guess that means that every flag manufacturer is exempt from the rules surrounding flag etiquette. If this were Mitt Romney putting his “R” logo in place of our stripes, the media would be in Armageddon mode right now over how egotistical the move is and how incompetent any campaign must be to sell something that so clearly violates the flag code of the United States. The media won’t hold Obama accountable for Fast and Furious, the deficit, the faltering economy, or lying about a lack of security that cost four Americans their lives in Libya — so this isn’t about to earn any kind of narrative. On a personal note, to see a sitting president replace the stars of our stars and stripes with his own campaign logo is simply depressing. At the very least, couldn’t our president be the kind of man who would shudder at the sight of such a thing?